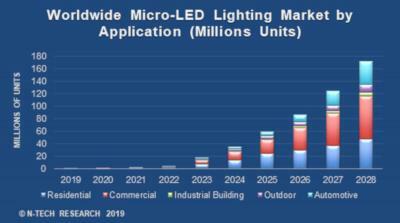 n-tech Research says that the Micro-LED lighting will experience very fast growth, with revenues exceeding $1.4 billion by 2028 with 170 million lighting units shipped. n-tech says that some industry analysts say that micro-LED lighting will always remain a tiny niche and only cater for novelty lighting. n-tech, however, sees several advantages of micro-LEDs compared to conventional HB LEDs and expect that these will be enough to earn micro-LEDs a healthy share of the LED lighting market. Fuji Chimera Research Institute says that the global microdisplay market reached $161 million in 2018, led by LCoS panels (59.7%) and OLED panels (27.8%). While some analysts expect Micro-LED to take over the AR microdisplay market, Fuji Chimera says that the technology is not mature enough and there are some technology challenges to overcome still - including those in epitaxial wafer process, mass transfer, defect detection and current drive. Market research firm Yole Développement has been following the Micro-LED market for some years with some very interesting insights and forecasts. Yole's technology & market analyst Zine Bouhamri was kind enough to discuss Yole's Micro-LED views with us. Mr. Zine is is a member of the Photonics, Sensing & Display division at Yole and he's deeply involved in the business development of the Displays unit activities. 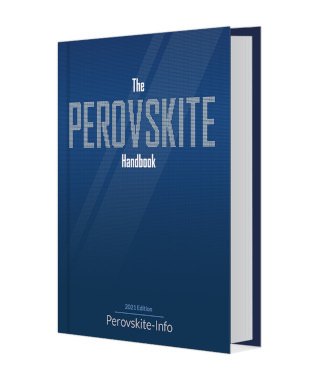 The MicroLED-Info team takes pleasure in recommending our new book - The Perovskite Handbook. This book gives a comprehensive introduction to perovskite materials, applications and industry. Perovskites offer a myriad of exciting properties and has great potential for the display industry. We believe that any display professional would find that perovskite materials are an area of focus that should not be ignored. The promising perovskite industry is currently at a tipping point and on the verge of mass adoption and commercialization and the first display-related perovskites are already reaching the market. 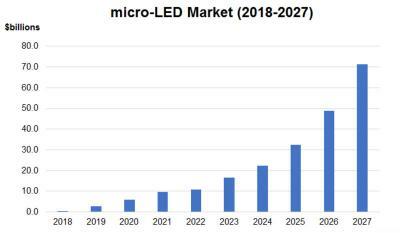 n-tech Research says that the Micro-LED market will emerge in 2019, with sales reaching $2.7 billion. The market will grow very quickly to reach over $70 billion in 2027.
n-Tech says that the immediate markets for Micro-LED displays will be near-eye displays (AR/VR), automotive HUDs and projectors - as these will benefit mostly from the small size, low weight, high brightness and high resolution of Micro-LED displays. Wearables (smartwatches) is another lucrative market (n-Tech sees $1.6 billion in smartwatch Micro-LED display sales in 2022). Yole Developpement says that there are still several challenges to solve before AR systems that are good enough for mass usage are developed. Yole sees the market finally emerging in 2022 or 2023. Yole sees three display technologies dominating this market - DLP, LCoS and MicroLED displays. 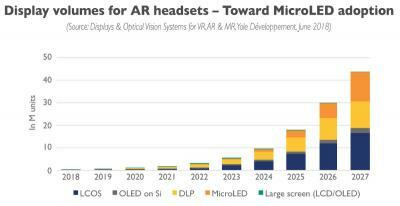 OLEDs are very promising for this market as of today, but by the time AR systems are mass produced (2022/2023) MicroLED displays will prove better than OLEDs. Japanese-based LED maker Nichia says that the company has been developing Micro-LED technologies for several years, and the company can produce micro-LED chips - but the company estimates that it will take at least four years for Micro-LED displays to reach real commercialization. 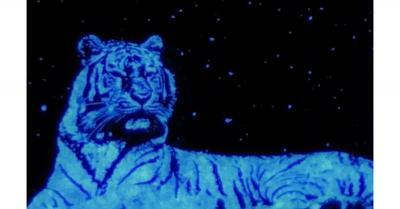 Nichia is not only developing Micro-LED chips, the company also develops transfer technology and related equipment.